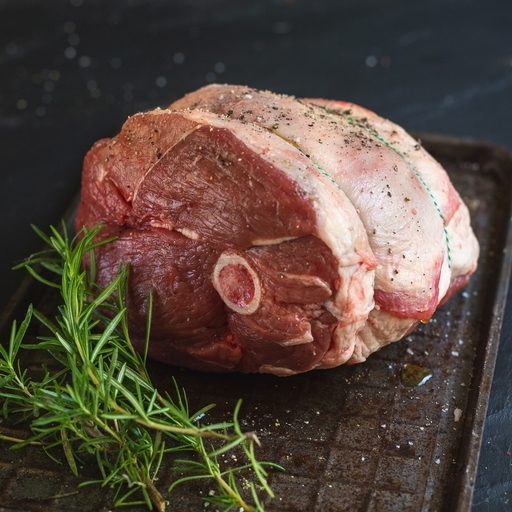 A generously sized half leg of lamb for your Sunday roast. We leave the bone in and as it roasts, the marrow melts out into the meat, seasoning it with natural flavour. You could also butterfly it for show-stopping grilling or barbecuing. Serves 4. Remove the leg from the fridge at least an hour before cooking to allow it to come to room temperature. Rub the leg with oil and season it well with salt and pepper. Preheat your oven to a high heat, 220˚C/Gas 8. Roast the lamb for 20 mins, until golden brown all over. Reduce the heat to 180˚C/Gas 4 and continue to cook for another 30 mins. This should give you a medium blush to the meat. Remove from the oven, cover in foil and leave to rest for 20 mins before carving. If you have a meat thermometer then 52-54˚C is rare, 60-65˚C is medium and anything above is well done. To get a bit more flavour into the meat you can cut 15-20 deep slits into the flesh and stud them with some sliced garlic cloves and rosemary leaves. A few crushed anchovy fillets work wonders with lamb too. For a good gravy, roast the leg on a trivet of onions, carrot, celery and stock. After resting the meat, strain the liquid and skim away the worst of the fat. It can be enlivened with a dash of Worcestershire sauce or a blob of sweet redcurrant jelly or Cumberland sauce.